With half of the year already behind us, there’s no time like the present to conduct a mid-year review. After all, it’s important to reflect on what you’ve been able to accomplish and which tasks still lie ahead. This way, you’ll be able to create a plan of attack for the remainder of the year. Whether you’ve been slacking on your goals or making great progress… Or maybe you’ve forgotten about your goals altogether? I’m going to share some tips to help you get back on track with your goals and make sure this year is a major success! Hopefully, you took the time to write down your goals at the beginning of the year. Whether they’re scribbled in your notebook, saved in Evernote, or published on your blog, find them now. Start reviewing your list and ask yourself which ones you can happily tick off. While you’re at it, make a note of the ones you’ve made some progress on, but haven’t completed yet, as well as the ones you haven’t even started. These are the goals we really want to focus on because they’re the ones that still need to be checked off your to-do list. If you want to, that is! 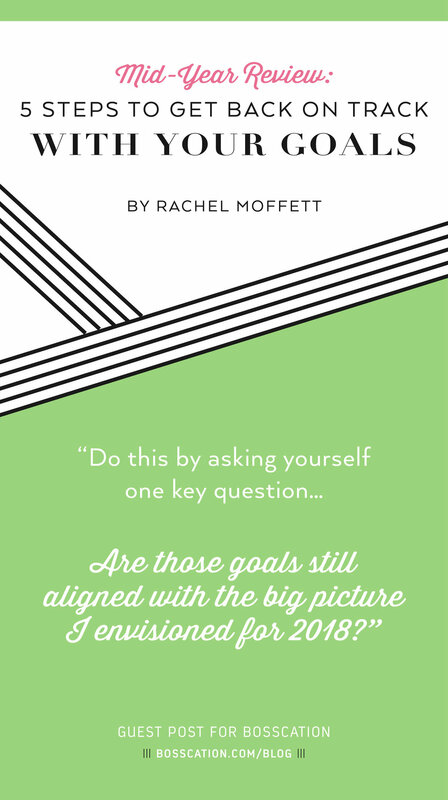 Are those goals still aligned with the big picture I envisioned for 2018? If not, you shouldn’t be afraid to let them go. Sometimes our priorities shift, which is totally okay. And other times, these amazing ideas come to us out of nowhere and we want to pursue them instead. We have to be able to realize when something is no longer the right move for us and direct our attention elsewhere. Being able to go with the flow and pursue the opportunities you’re most interested in is just one of the best parts about running your own business. It’s all about doing what feels good to you and what will leave you feeling fulfilled. If you find that you still want to accomplish those goals you originally set for yourself, that’s great. You can move onto the next step! But what if you’ve made the decision to scrap all of those goals your originally set for yourself? Well, you need to set some new ones! Think about what you’d actually like to make happen this year. What excites you? What kind of work do you want to be doing? Those should be your new goals, no matter how crazy they may feel right now. Now that you have a list of amazing goals to accomplish before the year’s end, it’s time to actually make it happen. The first step in doing that is to make them more actionable. And you can do that by breaking down those big picture goals into smaller, actionable steps. This makes them feel more achievable and less overwhelming. For instance, if your goal is to reach 200,000 monthly page views on your blog, set smaller milestones leading up to you hitting that goal at the end of the year. It’s less daunting this way and allows you to see when you’re actually making progress and when you’re slacking off. Then, you can make tweaks along the way if you aren’t hitting those milestones on time. Take a moment to look at your goals and write down all of the smaller steps you have to take in order to get where you want to be. Doesn’t it feel much more manageable when you look at those big goals like this? Absolutely! Next, you have to give yourself a deadline for your goals. If you don’t have a deadline in place, you’ll continue procrastinating and before you know it, the end of the year will be here. And you won’t have made any progress. Give yourself a realistic deadline that’s not going to leave you scrambling or stressed out to get it done. You need to allow yourself ample time to do the work that’s necessary of you. From there, it’s just a matter of making it happen. And you do that by putting it into your schedule and dedicating the time to it. So, take a look at your refreshed list of goals and determine what you’d like to work on and when. You have the remainder of the year ahead of you, which gives you plenty of time to accomplish some big things. Set those deadlines and start blocking off the time in your calendar. This way, you’ll know exactly what you should be focusing on at any given time. Because we want to make sure you’re staying on track with your goals, you have to find a way to keep making progress. What’s going to help push you along your journey? Perhaps having an accountability partner will make a difference! Wouldn’t you love to have someone who you can discuss your goals with and check-in with? Wouldn’t it be nice to have someone who can motivate you along your journey? Of course! Find yourself someone who can play that role for you and make sure you return the favor for them. If reflecting on the first half of the year has you feeling a little down because you didn’t accomplish as much as you had hoped for, you have to let those feelings go. We don’t always hit every deadline we give ourselves. And we won’t always achieve the success we imagined we would. Sometimes things just don’t go to plan and we have to accept that, not tear ourselves apart. Whenever you slip up, remember to just pick up the pieces and get back to work. The most important thing when it comes to your business is that you never give up. Rachel is the creator and blogger behind Define Your Hustle. Define Your Hustle is a community of women who are working to build thriving businesses they’re passionate about and that leave them feeling fulfilled. Having been a blogger since 2009, Rachel now uses what she’s learned to help other women get noticed online and finally ditch the day jobs they dread.